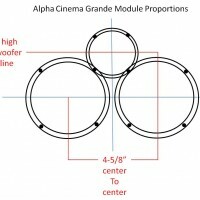 The Alpha Cinema Grande (ACG) is a low-profile module-based left/right/center channel cinema bar designed for explosive cinema levels in small to medium sized rooms. The high efficiency assures even entry level home theater receivers will drive the ACG to cinema-like levels, while the carefully selected driver complement assures wide dispersion, and low distortion. Integrated into a room, the ACG sits below the television blending into the room’s décor to assure a high spouse acceptance factor, while freeing up floor-space without sacrificing fidelity. 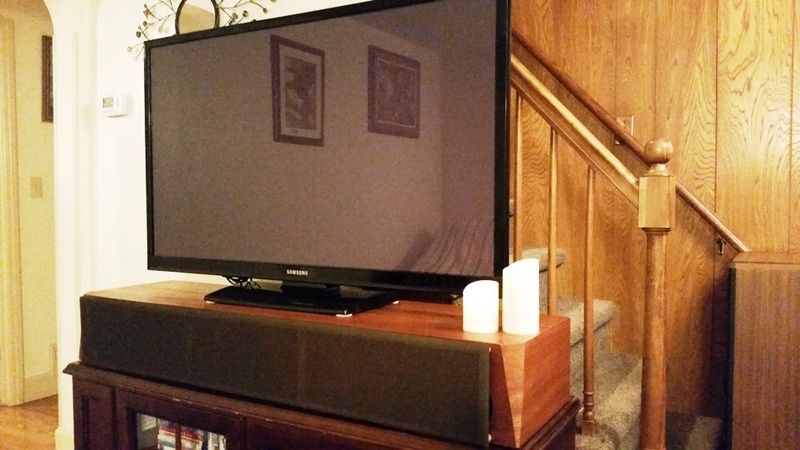 When used with any subwoofer, the ACG will also provide strong stereo performance since many home theaters are also used, if only on occasion, for music. 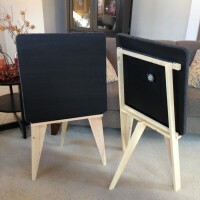 Without any crossover modification, it is possible to utilize the Alpha-4/ND25TA module assembly as a solo center channel, or an against-wall/in-bookshelf speaker, as long as the front baffle is at least 12 inches in length (or height if orienting vertically) and the 0.4 cubic feet of internal volume is maintained. Stroll through a big-box electronics shop, or finger-walk online for small home theater solutions and the field is fairly flat. There is the high end, expensive stuff, and there are the low-fi cinema bars with meek drivers and chip-amplification. The solution to this problem is the Alpha Cinema Grande. The ACG has to be affordable to build, but not a strict budget-build like the Tenacious 3. 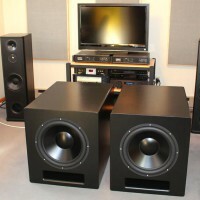 Careful crossover work will be required to compensate for the environment which is unique when you place loudspeakers, in this case 3 separate loudspeakers sharing a segmented cabinet, between two large surface areas such as a big-screen (40 inch or more) television and a low, wide TV stand. 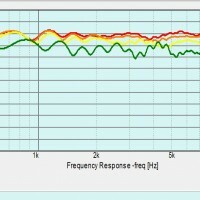 The running joke in the audio world is any given components “Spouse Acceptance Factor”(SAF). Simply stated it means: Is this thing pretty enough to be put on display in a home? The Alpha Cinema Grand has to be. It is going in a living room, nuff’ said. This will be accomplished with a tough-but-subtle look with a grille on the front, facets blending the sides, a low and wide profile, and a Mahogany veneer with a furniture finish. Finally, at 30,000 feet looking at the whole of what the ACG will be required to do, music cannot be an afterthought. Many times, specifically in small, affordable home theaters there is a duality required of the front loudspeakers to reproduce both the scope of a comet crashing through ones living-room and the subtly of a guitar-pick leaving the strings. All too often cinema bar type solutions fail to provide this capability. The Alphas Cinema Grande will have to be able to do both without question. The Alpha Cinema Grande was not worth building unless it could be efficient enough to bring cinema-like levels to small to medium rooms. Sounds easy until the requirement for a low-profile, and high SAF that extends deep enough in the bass meet the home theater requirement of 80Hz is thrown in and yes, why not make sure it performs great with music, too! I was ready to give up, and then I remembered that Eminence recently released the line-array/midrange driver the 4” Alpha 4. The Alpha 4, 8ohm version, will be used in pairs anchoring all three modules encompassed in the ACG. It is a pro-driver from eminence meaning power handling will be no-sweat, distortion is low enough to not color the sound, and they are efficient enough when used in pairs to yield 88dB after a full 6dB of baffle step compensation which will not be necessary due to large boundaries nearby. Ultimately, the efficiency should be closer to 91dB when the dust settles. In order to achieve extremely high output and durability, most pro-audio midranges utilize an extremely stiff suspension which disallows any mid-bass from them. This makes perfect sense, and is precisely where Eminence decided to push the limits. The Alpha 4 will play reasonably down to 80Hz in this application though not a hair lower! Despite being a midrange, to assure acceptable dispersion in both the horizontal and vertical domains (A big challenge of center channels and cinema bars alike), the crossover will be kept as low as possible while the center-to-center spacing will be minimized. To allow for these requirements to be met, a small-format 1” dome would be required. We live in a world where flat response is always heralded as the highest form of saintliness in loudspeakers. 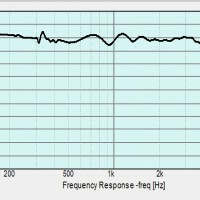 Why then, would one choose a tweeter such as the Dayton ND25TA that despite its flat pass-band response, has a large break-up seated at 18Khz causing the response to pitch and yaw at its top end? The answer is simple: How we perceive these anomalies in response are not always a terrible thing once room-reflections and our hearing are added to the equation. In fact, many enjoy tweeters with response such as the ND25TA describing the sound as having great “sparkle”, or an “airy” top-end. Not all tweeters with top-end break-up modes will exhibit these audible characteristics. In fact, in the infancy of metal-dome tweeters, it was the break-up being in the wrong place causing other issues aside from a wonky response that led to the no longer valid stigma that metal dome tweeters are “harsh” sounding or “fatiguing” to listen to. In the Alpha Cinema Grande, the ND25TA’s response will be utilized to provide sparkle when glass shatters due to gun-fire, and make for extended, airy response for music reproduction while the great transient response of the Titanium dome will provide pin-point imaging across the front sound-stage. Finally, ND25TA also touts 91dB of efficiency and shockingly low distortion, specially the 3rd harmonic which is universally regarded as the “devil’s harmonic” (perhaps not, but it is a measurable aspect one wants as low as possible). 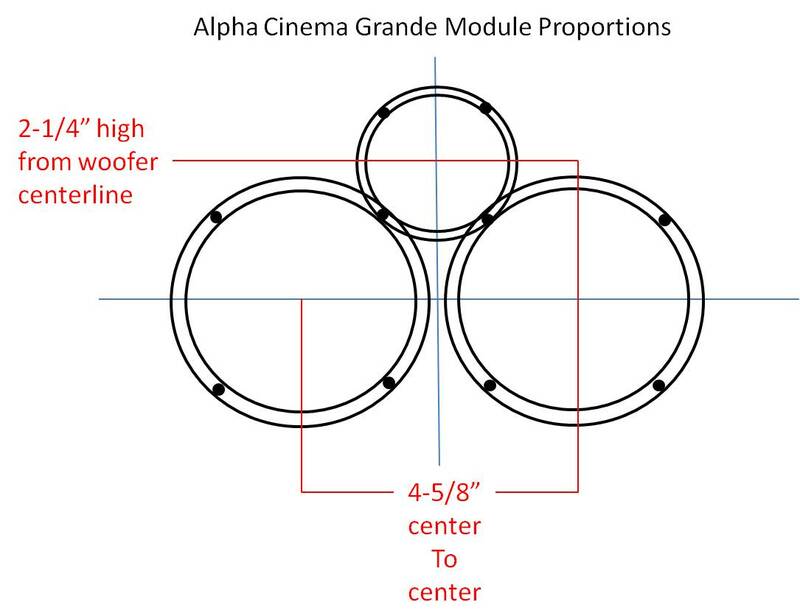 The enclosure design has some challenges since the Alpha Cinema Grande consists of three channels from a home theater housed in the same enclosure. One of the greatest of these concerns is vibration transferring between the separate enclosures. The dividing walls of the enclosures will be two layers of 0.75” MDF with ~2” of space between them that will be filled with playground sand. Each chamber wall will be lined with sonic barrier as well. The side-walls will be 1.5” thick to allow for the facets to be cut in while the rest will be braced 0.75” thick. Over-built? Yes. Assuring a rock-solid cabinet is something we are fortunate to make happen as DIY-ers. 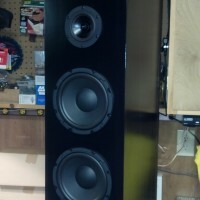 A little extra time an effort goes a long way toward great sound when applied throughout the entirety a build. Each chamber comes out to be approximately 0.45 cubic feet (~13 liters). The width of the ACG can vary to fit TV stands 40 inches to 60 inches, keeping the chambers as even one-third parts of the whole enclosure. The Q of each chamber is 0.692 with the 60” width to 0.724 with the 40” width. 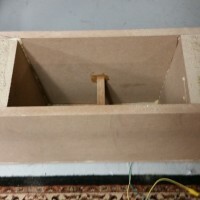 This is a very small technical change in terms of enclosure tuning that would be averaged by the room/environment with an 80Hz crossover well before the difference would ever become notably audible. It is possible to use the Alpha 4/ND25TA module assembly as a center channel so long as the baffle is 12 inches or wider and an internal volume of 0.4 cubic feet is maintained. 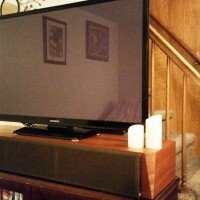 This will work well when used with large speakers and extra efficiency is required. The proportions of the Alpha 4’s and the 25TA’s is set by alignment of the two bottom screw holes of the ND25TA to the top left, and top right screw hole of the Alpha 4 pair respectively. This aligns the drivers correctly in acoustic space as a single module. 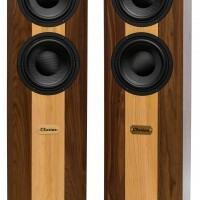 So long as the proportions are kept correct, justification to the top of the speaker, or the bottom matters not. One complete module assembly gets centered, and the left/right should be justified to the far ends as much as possible. In this build, it was determined by the width of the facets. It is OK that they left and right channels will not be centered in their cabinet chambers. Lining the cabinet chamber walls with Sonic Barrier and 3oz. 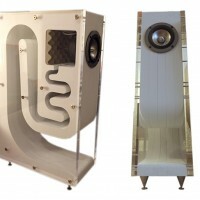 of Acousa-Stuff per chamber easily takes care of any errant reflections internally. Also: No worries on the non-countersunk tweeter. Math will tell you where the blips should be measurably, however they are not visible, and I would shake the hand of the person that can hear it in this instance. For this design, it is more advantageous to have the better acoustic alignment between the woofer and the tweeters on the z-axis. Edge-treatment for diffraction effects such as facets and roundovers are not necessary. Any use of these would be primarily cosmetic in this build due mainly to its application which will have large reflective surfaces adjacent to Alpha Cinema Grand. After laminating the dual-thick sides of the ACG, the only other real trick-shot was filling the sand chambers. 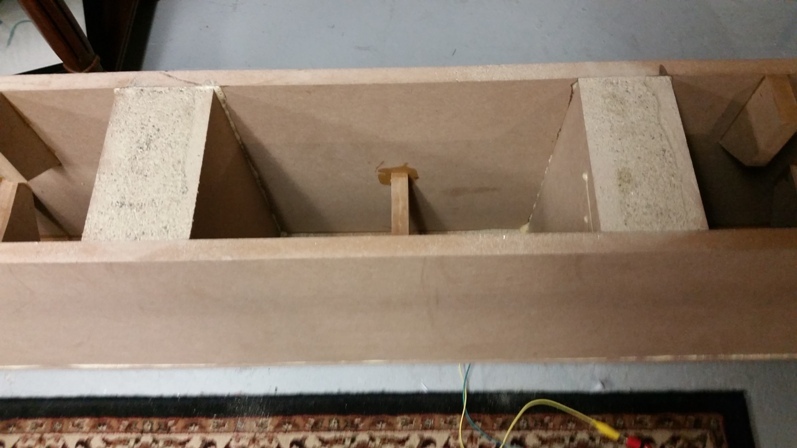 Once to the point where only the front baffle was left to glue in place, I made a make-shift vibration table out of two 8” woofer sitting in the driver cache. This worked well, and helped pack the sand in to assure as high of density as possible. Once filled with as much sand as possible (nearly 25lbs worth), the baffle was glued in place. 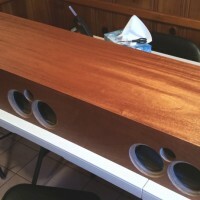 Since mahogany veneer was going on, the entire cabinet was then sanded to 80G, then painted with a foam brush using a 50/50 mix of wood-glue and water. I always let that cure for a couple of days over MDF to assure complete drying. Titan DX was used to adhere the Mahogany veneer from PE (BandIt brand) which was very easy to work with. 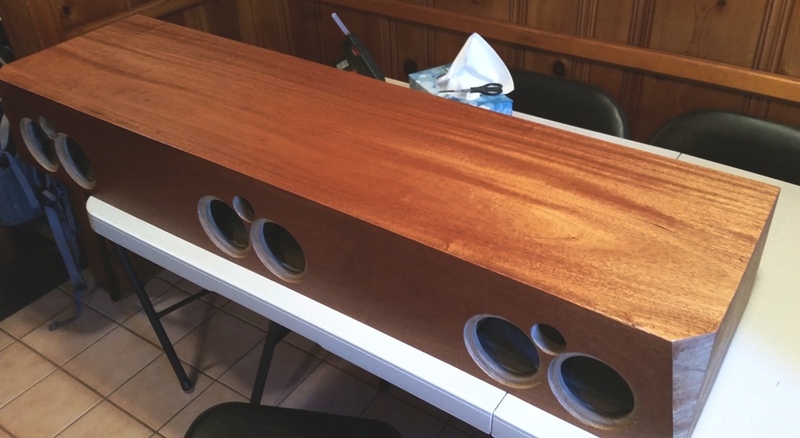 For a finish I wanted to bring out the natural beauty of the mahogany since it has such a reflective grain. After sanding the surface to 600G, I then applied two very thin coats of high gloss tung oil, sanding to 600G when dry. Historically I have not been a huge fan of the plastic-look of gloss polyurethane. I used two coats of a low-gloss wipe on polyurethane to finish off the cabinet and was very happy with the results. In a living-room, as much as I would love the wood to have a completely natural finish, durability is a must. The low gloss poly added the durability while the tung oil highlighted the natural reflectivity of the grain. All the while, the end finish looks very natural. The final element was a grill to soften the look once in-room. Ironically, everyone seems to universally agree (including significant others) that it looks better with the grille off. Oh well, I got to practice some grill making anyway. Mitered molding makes a nice grill frame. From there, it is just a matter of adding grill cloth. One miss was the addition of supports in the middle of the fame which were required due to the length of the pieces. The tension of the grill cloth can (and did) cause some bowing and warping. They were added after, however it would had been easier to due during the assembly of the frame. Prior to veneering high strength neodymium magnets were sunk into the front baffles. Once veneered over, they leave a clean face and complementary magnets in the grill make a very firm attachment. The goal from the off-set for the ACG was to have exceptional polar response in both the vertical and horizontal domains. 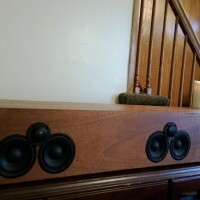 With the careful driver geometry chosen, as well as utilization of an optimized D’Appolito type of crossover, developed by Joseph D’Apploito for an MTM loudspeaker configuration, this goal was met. The full-range capability of the Alpha 4-8 is actually quite impressive. Once on-baffle it measures remarkably flat and has excellent extension. This created more of a problem than it cures since the target crossover was 2200Hz assuring a good acoustic power match between the alpha 4’s and the ND25TA. A Zobel was added to help shape the top end of the crossover after the knee a bit, though using the Alpha 4 as a midrange, this would likely not be necessary. The ND25TA is a peach. With its smooth response, and ability to cross over surprisingly low with a 3BW slope, it happily accepted the challenge of crossing over at 2200Hz as show in the distortion sweeps. At a level of 95dB at 1 meter distance, the ND25TA’s THD was a remarkable -40dB. The second order harmonic dominates this measurement which is apparent when listening to it since it is very clear, has great apparent transient response and speed, sparkle, and does it all without sounding fatiguing. 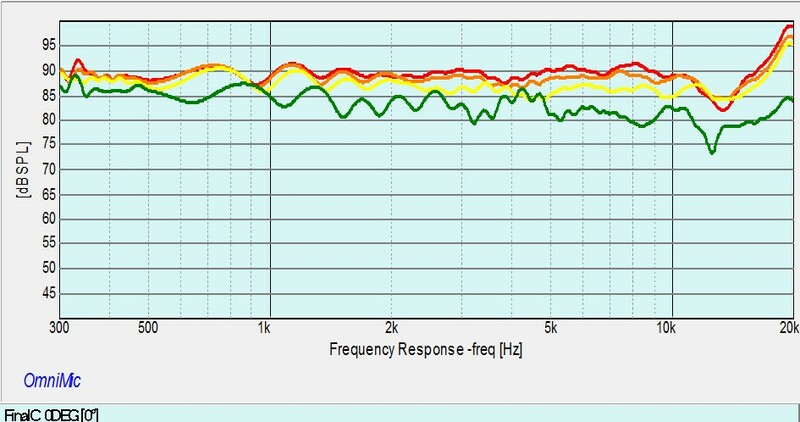 The third order harmonic was -50dB falling lower at higher frequencies. Definitely a good value for the money in the small arena of small-format tweeters though for some, it’s top-end break-up may not make it ideal. Impedance across the ACG is a fairly easy. Its minima occurs at roughly 180Hz, has a magnitude of 4.5ohms and is just about resistive which should pose no threat to “8 ohm” receivers and amplifiers. The worst reactive load occurs at 700Hz with a magnitude of 6.8ohms and phase angle of 25 degrees. My 15 year old Pioneer receiver has no issue driving the ACG to cinema-like levels. Between the measured results and running it hard, I am comfortable saying it is an easy load to drive. Lining the cabinet walls in combination with the sand chambers goes a long way for isolating each module of the Alpha 4/ND25TA. Instead of making a make-shift vibration table out of storage-woofers, a palm-sander against the side of the cabinet will do an excellent job at packing down the sand. Long-term Tech Talk forum veteran and cabinet maker “Squidspeak” popped this tip in on me after the damage was done, but would have definitely make life easier if I was in the know ahead of time. Watch the crossover size. Given the size of each module chamber (~0.4 CF), build em’ long and narrow so they fit through the Alpha 4 hole nice and easy. I would simply “rag-on” (use a rag to wipe) both the tung oil, then poly with a very light sand in-between. Foam brushes can vary in density and caused some issues when I first began finishing. Set the home theater receiver speakers setting to “Small”, and subwoofer to “On” for the optimal mating of the Alpha Cinema Grand and subwoofer in-room. 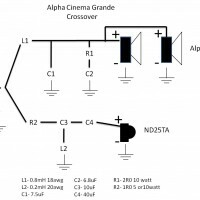 If there is an adjustable crossover in the reciever, set it to 80Hz. If building the ACG as a modular system and orienting the speakers vertically, the tweeters should be toward the inside of the listening space, not the outside. The Alpha Cinema Grand hit all of the goals it was designed to do. With its great efficiency, it plays to theater-like levels in small to medium sized rooms with the power of a humble home theater receiver. 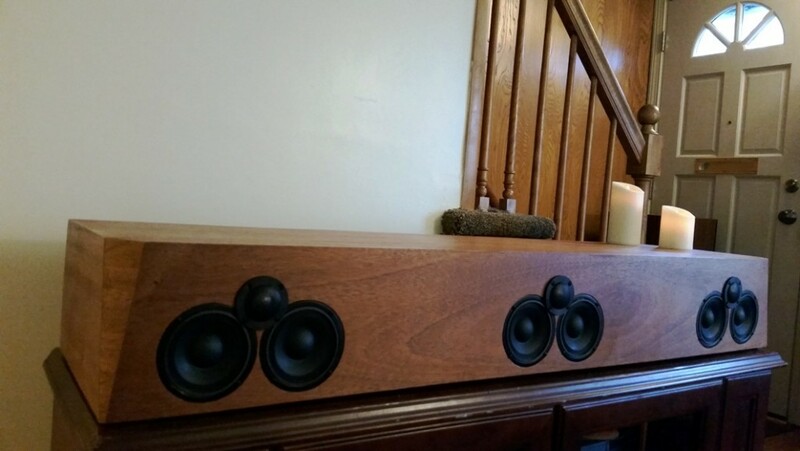 The mating of a pro-audio midrange/midbass with a metal dome tweeter capitalizes on the strengths of both, and it performs well for both music and movies while blending into the environment. For most main/center combinations my average volume level on my receiver was in the -30dB to -35dB range. The Alpha Cinema Grand’s high efficiency means my new listening level is in the -55dB to -60dB range while my receiver runs nice and cool. Though this was all part of the design goals, it was a bit shocking to see in action and one result I was thrilled with. Another particular item I was thrilled with is the Alpha 4. The Alpha 4 can almost run full-range and is as smooth as one can ask for a measly $30/pr. I think this lil’ mid-bass (more mid than bass) would shine when used with a very large woofer in a “MTMW” design, or even a “TMW” design with a higher efficiency woofer, utilized wide-band to a small-format dome tweeter, ribbon, or the like. Truly a low distortion (as good as some “reference” drivers), high power, inexpensive driver with surprising resolution that measured consistently over the six units I had. Check out the detailed write-up in the Tech Talk forum Project Gallery for more information! Michael Zisserson is a member of the Parts Express Design Team. Some sort of drawing of the cabinet would be very helpful. The cabinet width can vary since it is modular. That way it can be built to accomidate different stands. If you would still like a drawing of the unit as built, please e-mail me and I will be happy to accomidate. Apologies in advance for the delay, It seems I did not recieve or missed the notifications that there were messages. Looks like a very elegant design. I have a simple question. 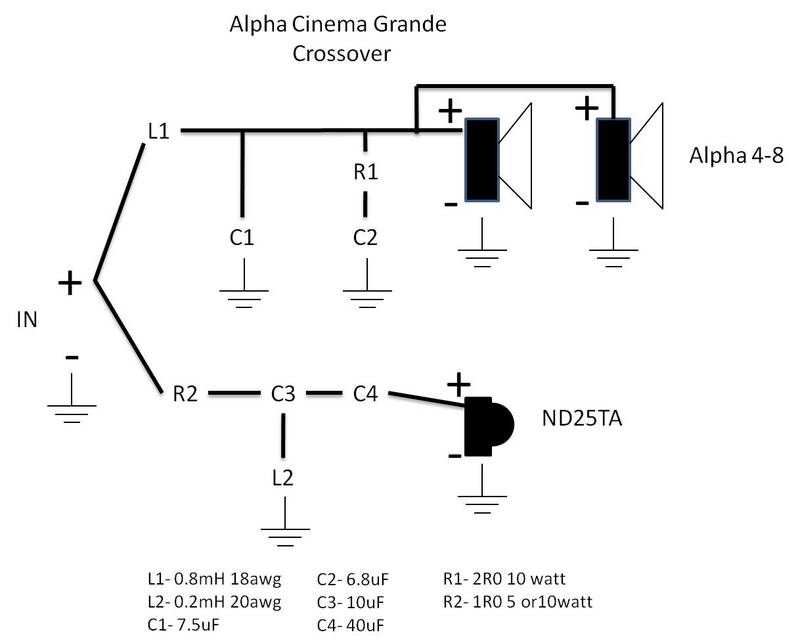 The crossover schematic shows a 40uf capacitor, but the parts list doesn’t have it. Is this cap actually the 4.7uf in the parts list? Thank you very much for your design and help.